My friend Beth recently launched a hilarious website called Dogstruction.com that documents the over-the-top messes our dogs make of our lives. It’s based on the formula that while you love your pet (or, child or partner or roommate), your pet happens to love your couch, toilet paper, your remote control and your most expensive shoes. But you know what? There’s a bright side to the dogstruction our doggies make in our lives, too. To prove it, I created a top ten list for Beth to share with her readers—and now I want to share it with you, too! 1. Remember, the amount of your doggie’s damage is in proportion to how much your dog loves you and wants to be out of that room and hanging with you. So that’s a lot of love. 2. Flip-flop it: That ruined door will make great firewood, after all, and the hole in the drywall? Well, you were looking for the perfect opportunity to put in an outlet in that corner…. 3. 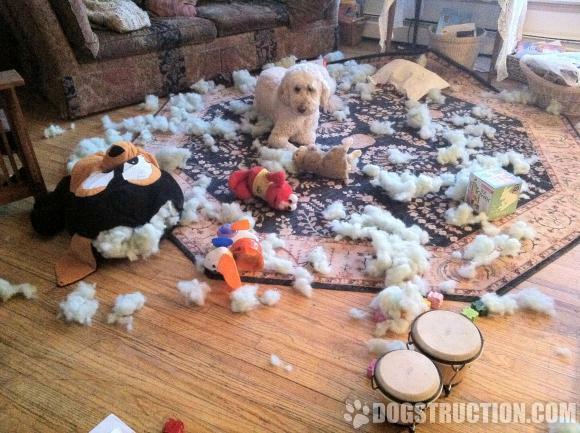 If doggie didn’t mess stuff up, your house would always look just as you left it. Yawn. How boring is that? 4. The truth is, those blinds/cushions/walls weren’t worthy of you—they being an hour or more old already. Really, you deserve to get (yet another) brand new version of it. 5. Okay, you’re looking at all that your dog destroyed. But then, look at what he or she didn’t destroy. 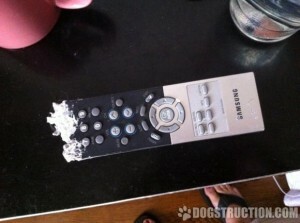 Chances are there’s something else in that room you can be grateful survived your dog’s wrath! This time, anyway. 6. Well, the worse the damage, the better the story to share at your next party. Hey, if you’re really lucky, maybe your dog will destroy your bedroom and laundry room next time! 7. True art is one of a kind, right? Well, enjoy your new art. No one has a bench or window or crate or toy that looks exactly like that, with the stamp of your “artist’s” teeth and paws all over it. 8. Technically, it is just stuff. Stuff you loved, but still, it’s just stuff. At least your true heart and soul—that dog of yours—is safe and okay. 9. Be honest: Did you have something better to photograph and put online to make your friends laugh this week? 10. Sigh. Look at that guilty face. Look at that adorable guilty face. You know you love it. Because despite the maddening dogstruction in your home, your life is so much better with your doggie—or kid or partner—in it. Check out the hilarious dogstruction.com—or Google photos of the messes other people have had to clean up. Because, really, nothing puts your mess in perspective faster than knowing someone else has had it worse.